Buckle up, these racers are ready to rumble! Kids (and adults!) love RC cars. 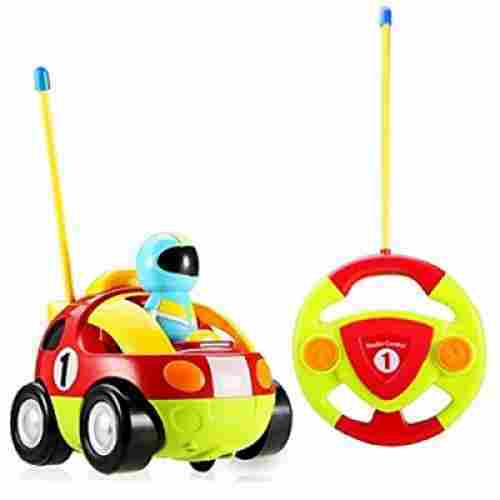 The ability to race their own miniature vehicles around the safety of the house or backyard has been tickling little ones for ages. RC cars help kids to better evaluate and understand cause and effect, as well as developing hand-eye coordination, problem-solving, and motor skills. 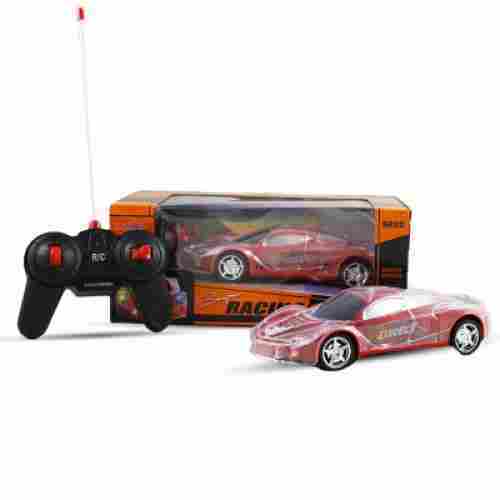 RC Cars are a widespread phenomenon, with fun, cartoon models for those in early childhood, and sleek, modern vehicles or stunt cars for the older kids. Check out ten of our favorites, all touted by users as the best in the business. No RC car is too fast or too furious for little racing enthusiasts! With this recent update, we made sure that all of our remote control cars on our top ten list still had the best rating that the market had to offer for 2019. We also made sure that over-all that all of the cars on our list were 100% safe for your child to use. For this buying guide, we also converted this guide to our new layout. From the outside this looks like your typical off-road truck, but upon closer inspection, this truck has one unique quality. It can be controlled by either remote control, or a foot-operated pedal. 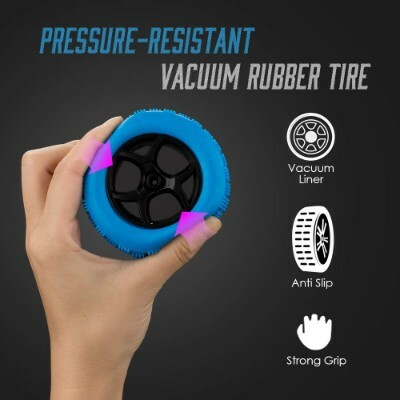 The 14” wheels are built to go over the muddiest of dirt, while featuring a nontoxic plastic exterior, working LED lights, and three different speeds. Music inside this super cool cruiser can be controlled with an AUX cable. 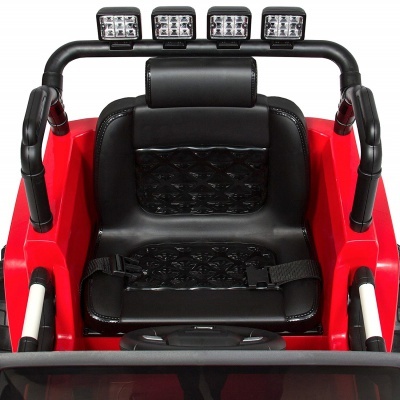 It’s a single-child ride on truck, but can be controlled via remote if there are no passengers. Are you still looking for that perfect remote control car for your toddler, but don’t want anything too complicated and over the top? The Holy Stone RC Cartoon race car may be just what you’re looking for. 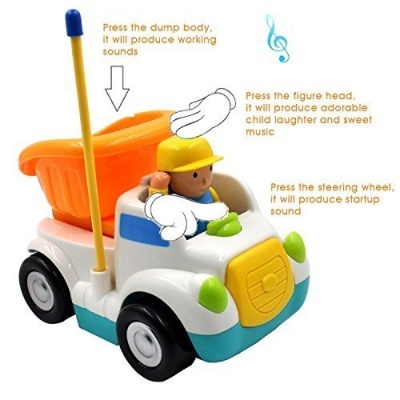 The car itself also makes honking sounds and plays music, so that your little one can jam along with the tunes coming out of their very own car! 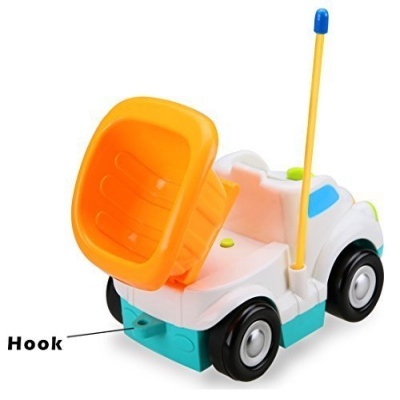 The tiny driver inside is removable, so it very easily becomes a two-in-one toy. Out of all the rc cars that are safe for the youngest of kids, this has to be the one that stands out most in the eyes of your children. It's bright colors and cartoonish design are made specifically for that. The great thing about this toy is that it is an introduction item. 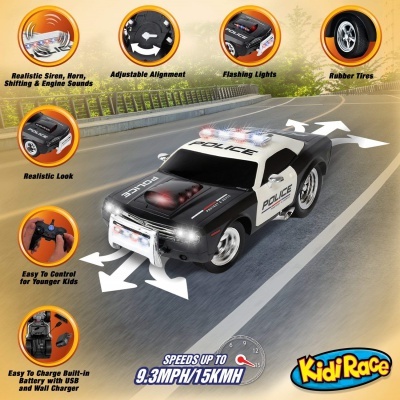 The KidiRace Police Patrol RC Car is truly designed to give a realistic experience. Emergency lights flash red and blue to let citizens know that help is on the way. A horn, siren, and revving engine please eager little ears. The car features kid-friendly controls so little ones of all skill levels will be able to drive. A tight turning radius and non-slip rubber wheels make fast action-driven decisions safe and maneuverable. 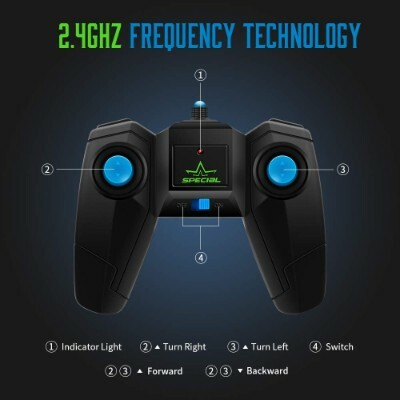 The 2.4 GHz technology allows you to race multiple cars without interference, so children and up to five friends can all get in on the action. This RC car lets kids race around, role-playing as some of their favorite community heroes. 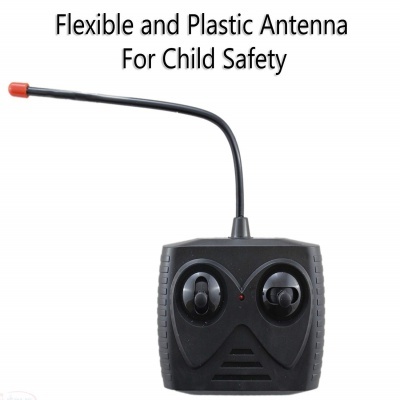 The realistic lights and sounds will thrill and stimulate young imaginations, and the car’s quick response time means an advantage when it comes to growing motor skills and hand-eye coordination. 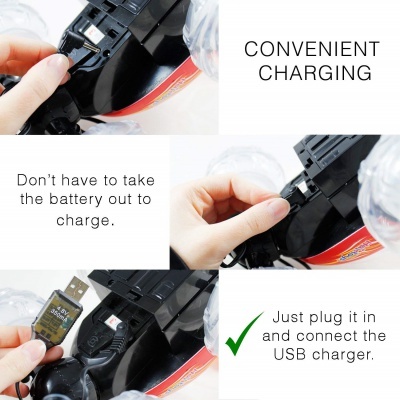 A mini USB makes it easy to charge, and compatible with plenty of usual household outlet appliances. With expanded range and fast control response, kids can race to their heart’s content. The battery is built-in and rechargeable, with 30 minutes of continuous driving time. Not only that, but KidiFace is so confident in their product that if you don’t like it for any reason, you can contact the company for a 100 percent money-back guarantee. 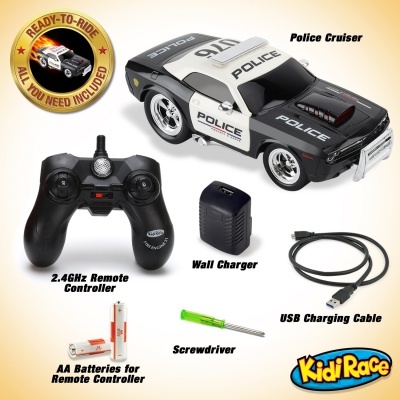 If speed is your thing, we’ve got the remote control car for you and your child. 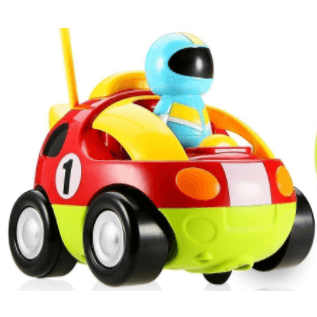 Haktoys had some fun with LED lights, and created a super fast, super flashy sports car that’s perfect for speeding around laps. Leave all the other RC cars in your dust as you watch your kid smoke them with their light-up race car, that features full forward-directionals and backwards-directionals. Remote control cars that are built for speed racing often are not completely safe for any age below a pre-teen. This car is fully ASTM-certified, which means that you can create fun for the whole family -- no age limit necessary! This high-end racer is completely nontoxic and ASTM-certified, which guarantees safety for all members of your family. Set up a racetrack from the front of the house to the back, and watch your kids speed off into victory! 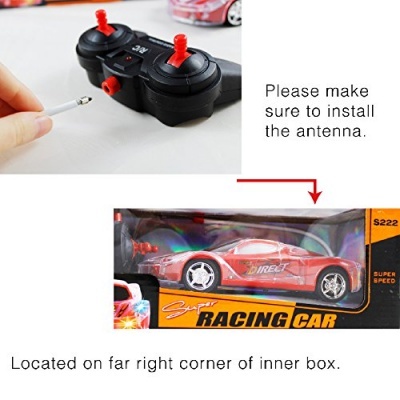 The remote control transmitter comes with its own antennae, so you don’t have to worry about distance to run this car. 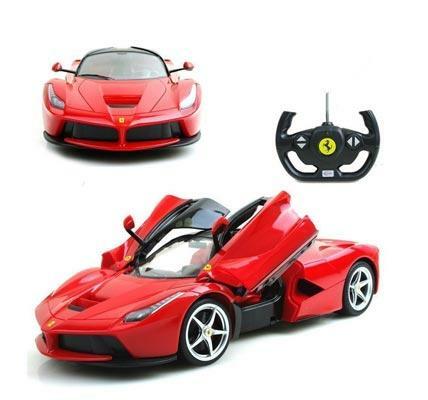 If your kid loves the prancing horse, then you simply need to give him or her the 1/14 Scale Ferrari LaFerrari RC Model Car. The radio controller is shaped like the ergonomically-designed steering wheel of the real LaFerrari. This means you have more range and opportunity to let your child play free. Boys will love this, so when you need your time, let them have at it and you can do what you need to do, no matter where you are. 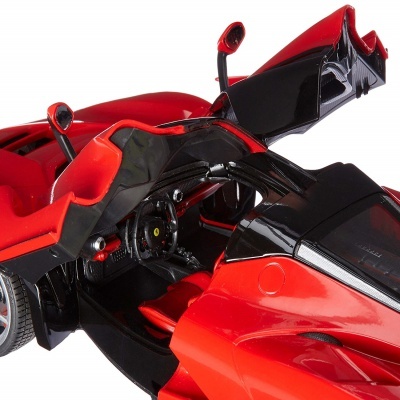 Just as the Lamborghini rc car that came before, this toy is an aesthetic marvel that would make Ferrari proud. Kids will enjoy it for hours and on top of that, the car has all of the looks and speed of the Lambo, but is not as low to the ground. It comes complete with all the fully functioning features of the real FXX-production car including a unique butterfly doors that opens pretty much like a scissor-type door. Ready to wow? The Zomma 4WD Stunt Racer tricks, turns, and tickles spectators’ fancies. This stunt car flips 180 degrees, rotates a full 360 degrees in an instant, can roll and flip over, or even go off road. It has a maximum speed of 7.5 miles per hour, enough to really get going on backyard or living room tracks. Constructed from high-quality ABS and thick wheels, this car is durable and built for the long haul. This car can flip 180 degrees and just keep driving. Not much can stop it, besides a dead battery, but it’s got a solid charge time and the batteries are rechargeable so you won’t be spending hundreds on new Duracells every time it runs out. With over 30 feet in range, kids can spin their new wheels from across the yard or room. An LED light allows this racer to glow in the dark. A 400 mAh USB rechargeable battery allows for a continuous drive time of up to 20 minutes. Kids can play alone or join up with family and friends to race. The RC system has been designed so that frequencies won’t interfere with each other, and groups can all enjoy good quality bonding over their favorite cars. RC cars help enhance children’s hand-eye coordination, cognitive reasoning skills, and motor skills. Plus, they’re just plain fun, and great to pull out when you’ve got a collection going and want a group activity for some socializing. One of the top remote control cars for toddlers and preschoolers is the HAK101 Invincible Tornado Twister. This RC car comes with a unique 3-point axle system so that even if your child will be tumbling it upside down, it will still be able to run like any other RC car. Unlike other RCs however, the Tornado Twister corrects itself up when overturned. Plus, it comes with a variety of LED light effects. It can be played with for up to 15 minutes on a full charge which usually takes 2 to 3 hours. 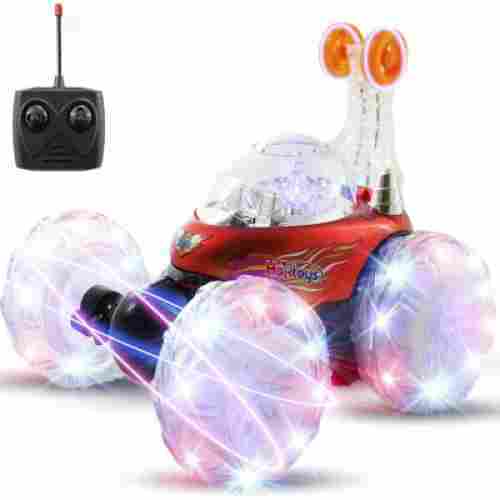 The combination of stunts and LED light shows make this a very stimulating RC car for young kids as it can benefit their continuing brain development. It is great for stimulating creativity among young kids as well as enhance their imagination. Last we checked, no one said that remote control cars were only for boys! 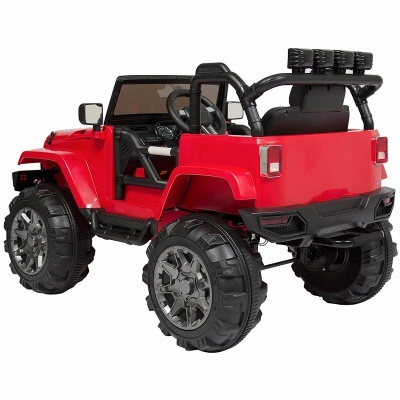 The GIRLMAZING Big Foot jeep is the perfect vehicle to get the girl in your life involved in all of the off-road fun. Girl power never loses its cool factor, and the fact that Jada Toys created a gender-inclusive remote control truck is cool in itself. It’s great when a girl can feel like she fits in with the boys, and even more so when her truck can speak for itself. 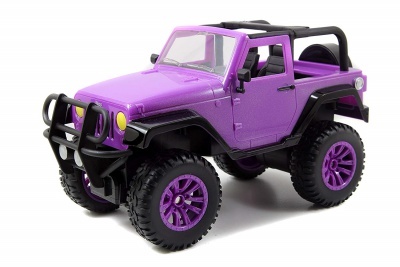 Taking a queue from the popular Jeep design, Jada Toys created a truck that’s perfectly purple, fully customizable with the glamour deco stickers included, and just as capable as climbing the same terrain that the boys do.
. Don’t let this bright and colorful design fool you, the roll bar up to and push bar in the front are definitely not just for show! The Claw Climber Cheetah is a high power R/C containing a torqued out engine that amps up with extreme power. It catches air as it leaps over rocks or other obstacles you create! The vibrant orange color is attractive to kids of all ages. The tigers face makes it an extermely exciting choice for kids who are into animals. Painted very well with small details that really count! This tiger is on the go and full spring loaded to handle the jumps and bumps like any tiger would in the wild. Go outside and ride this bad boy on the pavement or over the rocky village in your back yard. You'll never be low on excitement with this powerful R/C. Their are bad to the bone claws that pop out the ultra treaded tires; this means ultimate grip on even the most challenging terrains. This beast will jump out over objects easily creating a mega fun experience. Sometimes all a child needs in a remote control car, is some extra storage space! Rather than stock them up on fancy, flashy cars that have no space and are just good for zooming around the room, why not try a remote controlled dump truck? Normally, you’d never find anything special about a dump truck -- But boy did Holy Stone prove us wrong! This dump truck not only comes with a toddler-safe remote control, but makes real working dump truck sounds when the dumpster or driver are pressed. This tiny dump truck is great for teaching your kids about coordination. With only front and back controls, they can easily learn what it takes to coordinate routes both around, under, and over things. The driver in this truck is removable, so he can pull double duty when he’s not driving his truck! 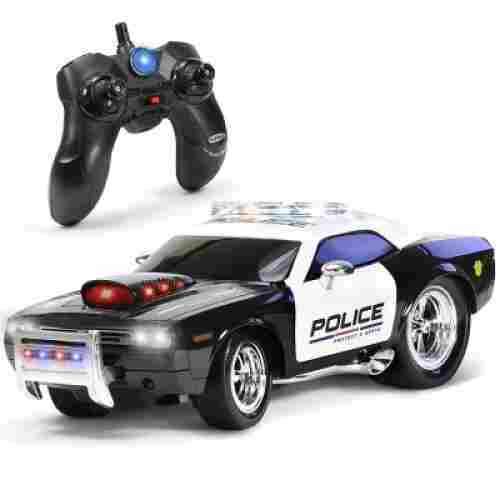 Choosing the top remote-control car for kids is like choosing your very own car. There are plenty of brands and models to choose from. Like their real-life counterparts, RC cars are available in a variety of styles and designs each of which can appeal to a certain age group of children. More than that, the features of these RC cars must also be appropriate for the level of development of the child. This is basically the crux of our search for the top remote-control cars for kids. We have to make sure that those listed in our top 10 are developmentally appropriate for a particular age group so that the child’s psychomotor, cognitive, emotional, and social development are fully optimized. 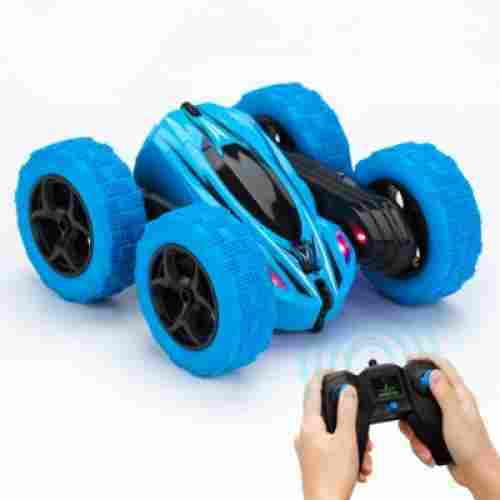 Additionally, we had to look at the safety features of these RC cars as well as what other parents and consumers have said about these kinds of toys. We then looked at the overall credibility and trustworthiness of the company that manufactured the RC car. We are sure these are the same things that you will be looking for. Our shortlist of the 10 top remote-control cars is thus, a product of extensive and in-depth research. We know how difficult it can be to find the right one for your child. Hopefully, our list would help you narrow down your choices. It doesn’t matter where kids play with their RC cars. 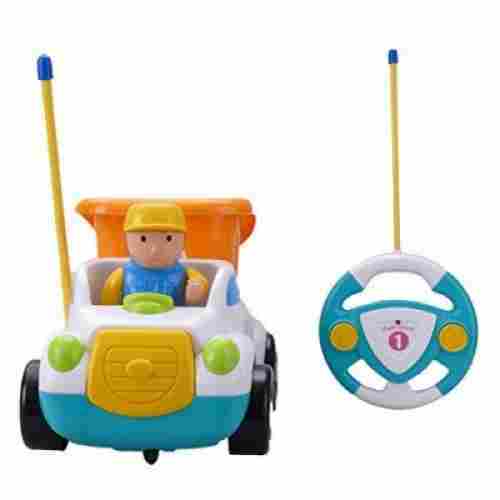 The point is that these are best played with the family around as young children will be proud of showing off their newly found driving skills while older kids will take pride in their creations. Whatever the case, playing with RC cars can substantially improve and strengthen family bonds. This can have a significant impact on the child’s emotional health while facilitating the development of his or her social relationship skills. If kids feel that their families appreciate or are strongly affirmative of what they’re doing, this can provide long-lasting happiness to kids. Always make sure you supervise children when playing with these types of toys. Let them play in a secure area away from busy roads. Always make sure you buy from trusted manufacturers. Like all playthings, kids' and toddlers' remote-control cars can provide children with a host of benefits that may not otherwise be seen in other types of toys. From an improvement in their motor skills to the enhancement of their cognitive abilities as well as the development of the emotional and social aspects of their being, children will do well playing with RC vehicles. And in case you’re still doubtful, here are five big benefits of remote-control cars. >There are remote-control cars for toddlers and kids that come as kits where the kids themselves can assemble them. 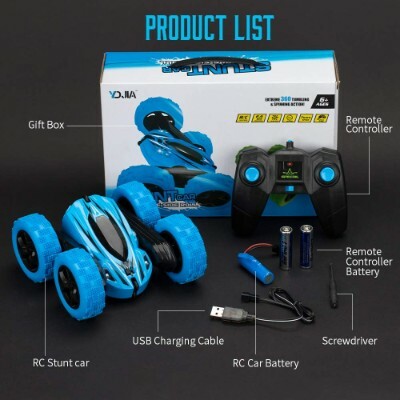 There are also those that you can purchase individual parts and accessories to come up with your own unique design and style of remote-control vehicle. 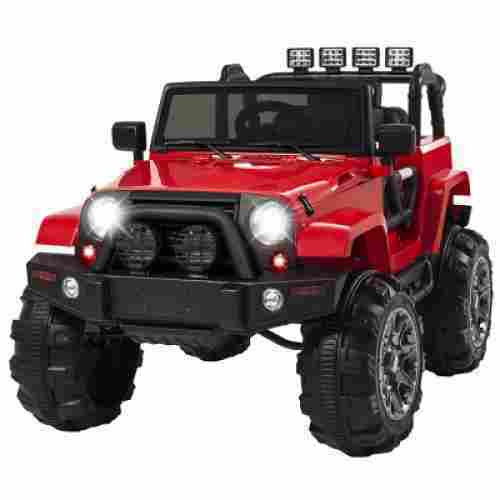 While these types of toys are best for older children as they already have more than the basic knowledge of how such toys work, the mere fact that these kits give children the opportunity to build their own speedsters, roadsters, and all-terrain vehicles simply encourage them to use their imagination and creativity to the fullest. It should be evident by now that imaginative and creative thinking begets superb logical thinking and scientific problem-solving skills. Children will have to decide whether to put a certain kind of vehicle part on their RC kits to achieve the desired outcome. This is the fundamental structure of the scientific process. >Remote-control cars don’t come cheap, especially those that one has to assemble from scratch. Early on, kids will learn the value of being responsible for their toys by keeping these in pristine condition, oiling the gears, removing dirt and debris, and even cleaning the different parts so everything is in order. They will learn to understand that everything we value should be well taken care of. This is our responsibility as owners of such things. Children can benefit a lot from playing with remote-control cars. The enhancement of motor skills, boosting of creativity and imagination, strengthening of family ties, and learning of the value of responsibility are just some of them. Driving a miniature vehicle from a distance, using a remote-control device, requires excellent coordination between what the eyes see and how the muscles of the hand react, pressing or toggling on the appropriate buttons or sticks to make the correct maneuver. The thing is that this is all a function of the brain. It receives visual input from the eyes and processes these bits of information and converts them into motor nerve impulses. This way, the hand knows which muscle group needs to contract to make the RC vehicle run faster, brake, or even perform outlandish maneuvers. All of these happen in a split second. And the more kids play with these types of toys, the more efficient is the connection between the eyes, the brain, and the muscles for optimum, seamless hand-eye coordination. Part and parcel of hand-eye coordination is the brain’s depth and spatial perception. When kids try to maneuver an RC car from a distance, their eyes are sending electrical signals to the brain which, in turn, makes a rough estimate of the relative position of the remote-control vehicle in space and in relation to its surroundings. The brain makes very careful assessments of the distance of the vehicle to the nearest obstacle or any other object within the RC car’s immediate space. These signals are then processed by the brain and the necessary motor impulses are sent to the muscles of the hand or any other group of muscles in the body. This is what is called spatial awareness and intelligence which form the basis of a certain aspect of problem-solving. This also helps in developing spatial intelligence as kids will know the position of the RC car in relation to space where it is as well as the different objects surrounding it. For example, they know if an RC car can fit in between the legs of a chair or even in between two different pieces of furniture. They learn to use their sense of space and whether an object will fit right it or not. q: How far do RC cars usually go before losing signal? This depends on several factors, two of which are the age group for which the car was made and the quality of the car. Usually, you will see good cars have a radio signal from 50 to 100 meters. q: How long does a battery last? Typically a good RC car will have from 20 to 30 minutes of play time. For bigger kids' RC cars, the battery life is longer as their cars have better components. For younger kids, you will usually see their RC cars last about 15 to 20 minutes on a full charge. q: How long does it take to fully charge a battery? This depends on how big the battery is, but it's usually from one to two hours. q: Can I leave my battery charging overnight, or when I leave?